Scott Ian of Anthrax to write DC Comic's "Etrigan the Demon"
Scott Ian, legendary guitarist for thrash band Anthrax and avid comic book fan, has just announced that he will soon be writing a series for DC Comics based on their character "Etrigan the Demon." 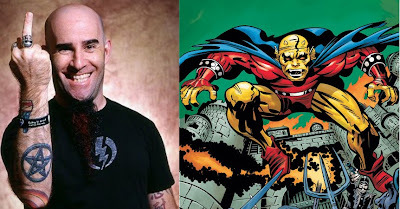 Scott Ian (who played an AMAZING set on their tour with Slayer) apparently has already written for the comic company, he teamed up with famed artist Sam Keith last year to write "LOBO: HIGHWAY TO HELL." For the non-nerd acquainted Etrigan is a rhyming demon from hell and alter ego of Demonologist Jason Blood. No news on the plot of the series or the release date but we'll keep you posted.